I recently purchased a commercial building that Barbara Wingate represented the seller for. The transaction included raw land, a commercial building, and a development component. Ms. Wingate excelled at every aspect of the transaction. I was thoroughly impressed with her knowledge, work ethic, and creativity to find a win-win solution for myself and the seller. After developing a relationship and trust with Ms Wingate, I want to continue to do transactions with her. I have worked in commercial real estate for decades and worked with many top commercial brokers around the nation and the world and I consider Ms. Wingate to be amongst the best. I will continue to try to acquire more properties from her and will consider her to list my commercial properties as well. In a culture of short term gains and transactions, Ms. Wingate differentiates herself by building long term relationships, transparency, and a positive attitude. I didn’t feel like she was treating our deal like a short term transaction, but more about building a long term relationship. In an age where it is easy to give anonymous feedback, I feel it is important to acknowledge exceptional customer service and work quality. As a small business owner and real estate investor myself, I applaud the culture that you’ve apparently created at your office and hope you have other brokers that aspire to Ms. Wingate’s professionalism and integrity. This letter is serves to recognize and recommend the service, professionalism, and, the expertise of Barbara Wingate as a commercial real estate professional. We have been trying for multiple years with multiple agents to sell our property in Evergreen CO. and Barbara was able to complete what we asked for unlike many of her peers. From my experience with Barbara, she has demonstrated excellent customer focus and service, market knowledge, and professional integrity. I highly recommend Barbara for your consideration as your real estate professional. She was always available to talk with me, e-mail me, and/or text message with me regarding anything related to my search and lease. Barbara’s commitment to selling our property far exceeded my expectations. This letter is to recommend Barbara Wingate as an experienced and caring realtor. Having had the opportunity to work directly with Barbara over the last few years, I feel that her knowledge and professionalism were essential in facilitating our recent real estate transactions. The "mixed use" property that Barbara listed for us is an unusual 10+ acre parcel containing a residence, school and event facility. Seemingly at ease, she juggled the complicated aspects of the property while learning the dynamics of the various businesses and parties involved. By communicating in a concrete way, her gentle demeanor, understanding and persistence anchored us all during the negotiating process. Barbara listens and discerns. She encouraged me when I felt overwhelmed and patiently guided me in what seemed an arduous task. I hold Barbara in high regard and am grateful for her talent. My husband and I have been working with Barbara over the past several months looking for a home in Evergreen, Co. It was through our son who introduced us; both are members of the local Rotary Club. Living in Houston, I flew to Denver on several occasions to meet with Barbara to review potential homes that suited our needs. Barbara's enthusiasm, communication skills both verbal and written along with her professional demeanor made her an excellent choice to represent us in seeking out our new retirement home. Barbara is reliable, dedicated and eternally upbeat. She always went above and beyond the call. I could tell she is passionate about finding just the right home for her buyers and will let you know her opinion if the home you are looking at may not be the right one for you. Always looking out for your best interest, managing her schedule to give us that one on one where we felt she was always focused on us and our goals was an asset we were looking for in representing us. 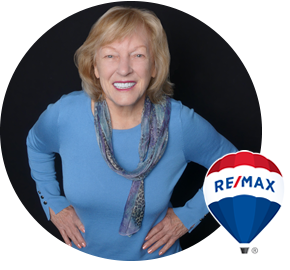 Organized and diligent, I would highly recommend Barbara as your personal RE/MAX commercial/investment agent. Relationship: I have known Barbara Wingate for the 38 years she has been in the brokerage industry. She is knowledgeable in the residential as well as the commercial aspects of real estate. Experience: Barbara Wingate has sold my last three homes and helped with other acquisitions in Texas and Colorado. She has served as listing agent and purchaser’s agent for countless home buyers. Barbara stays current on all aspects of technology in her industry and understands home buyer’s wants and needs as well as the legal necessities which protect her client. Performance: Ms. Wingate is industrious and tenacious. Her vigilance will not rest nor allow distractions to slow her progress in seeking the best match between property and client. She is a quick study in assessing the client’s needs because she is a good listener. Her professionalism keeps the client informed at each step of the march to closing. Strongest Recommendation: Added to the above, Barbara Wingate is a pleasant and kind Christian woman. I would use her again and again; and I certainly recommend her to anyone who needs real estate services.